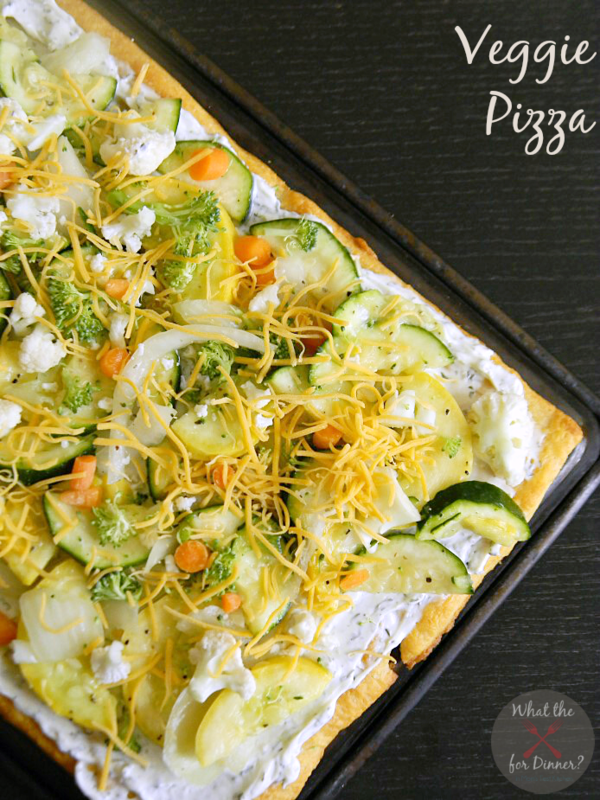 Veggie Pizza makes a perfect easy appetizer or a simple make-ahead meatless meal! When I was digging into Lynn’s recipes, trying to pick just one, I was having such a hard time. I’ve got strawberries in my fridge so I almost picked her Strawberry Pancakes with Mini Chocolate Chips. But then it’s hard for me to say no to bacon so maybe Bacon Wrapped Chicken Bites with BBQ Sauce (even though these didn’t get made for today’s post – they will get made!). But then I found her Veggie Pizza and knew it would be perfect for our Saturday night movie nights! A snack food that’s still hearty enough to be a meal. The thing I loved most about this Veggie Pizza is that instead of a cream cheese sauce which most Veggie Pizzas are made with & which I just really don’t like, this one is made with a refrigerated veggie dip. So much better! Unroll the can of crescent dough and press in the bottom of an ungreased 9x13 cookie sheet to form a crust, pressing together the perforated edges. Prick dough lightly with a fork. Bake at 375 for 10 minutes, watching carefully, until browned. Cool crust completely. Spread the crust with the veggie dip, using as much as you like - I used right around 1/2 of the container. Layer the vegetables on top of the dip. Sprinkle with the shredded cheese, using as much or as little as you want - I probably used about 3/4 of a cup. Cover loosely with saran wrap. Chill until ready to serve. Cut into squares. I love this idea. What a great pick! Hopefully with all of the veggies spring will be right around the corner. Your pizza looks amazing, Jaime! Crescent rolls are my kryptonite… there’s NO moderation for me with those buttery babies. 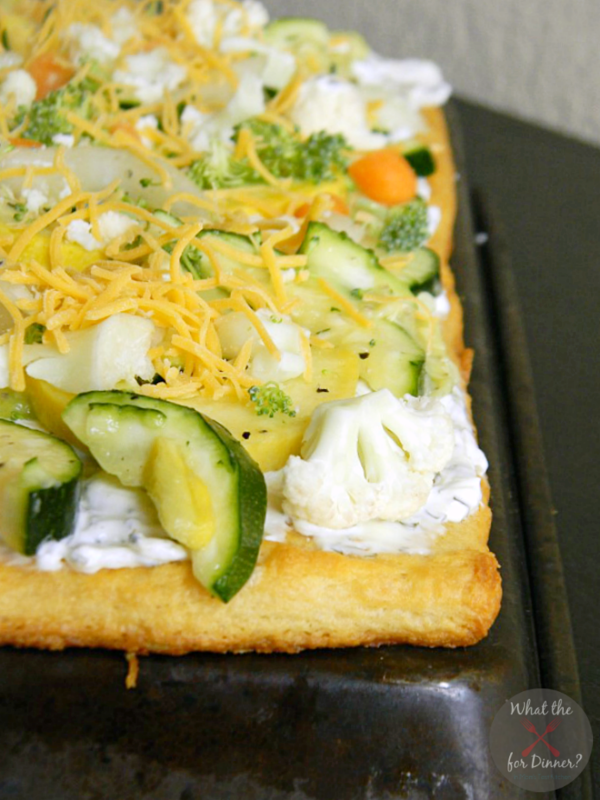 If I put veggies on the top like you did here, that nulls out all of the fat and calories in the crust, right? This looks so yummy that I had to add it to Pinterest. 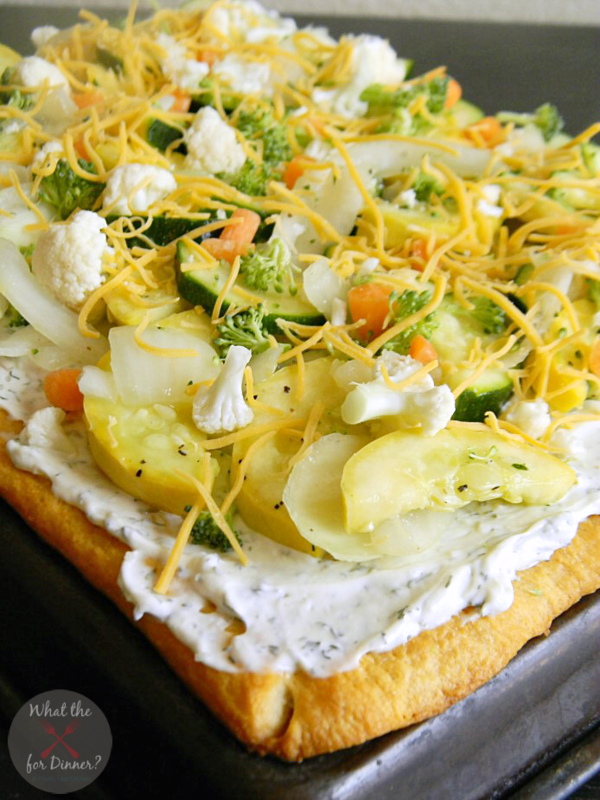 I’m going with what Becca said…the veggies counteract the crescent rolls, right? This looks fresh and lively. Nicely done for SRC! Perfect for a party or at home Saturday night movie night! Looks great. And I agree with you – I’m not a bit fan of cream cheese spread. Veggie dip is a good idea. That looks PERFECT for a spring dish – all those fresh veggies look so refreshing and inviting. Delicious!! What a great pizza! My kids may actually eat their veggies with this one 😉 Great pick..happy reveal day! Ooooh! I’ve had this at a party before and it was SO GOOD! I need to try it one of these days. Your version looks delish! Jaime this sounds perfect and your photos are beautiful. Just so you know, your photo always puts a big smile on my face. So real! jennifurla recently posted…Crumble Top Banana Muffins and my Crazy List.